LiveAgent is a leading customer support platform that helps small and large businesses deliver great experiences for their customers. Meetingbird's integration with LiveAgent makes scheduling meetings with customers easy right from LiveAgent. There are two ways to use Meetingbird in LiveAgent. The first uses LiveAgent's external plugin feature and the second uses the Meetingbird Chrome extension. We'll demonstrate both methods here. Select the gear icon labelled “Configuration” in the left sidebar. Scroll through the plugin options to find the “Display external info in ticket” option. Click “Activate” next to the “Display external info in ticket” option. Display method: Load directly into agent's browser. Now, open any ticket and click the cloud icon in the right sidebar to view the Meetingbird plugin. You can use the footer at the bottom to adjust the plugin height. If you haven't already, download the Meetingbird extension for Chrome here and follow the instructions for signing in or signup for an account. Click the Meetingbird icon in the Chrome toolbar to open the Meetingbird integration for LiveAgent. From here, you can add events to your calendar, insert meeting times into support replies, and access scheduling links. Open the Meetingbird sidebar from the ticket page (if you installed using the LiveAgent external plugin) or by clicking the Meetingbird icon in the Chrome toolbar (if you installed the Meetingbird Chrome extension). First, make sure that your reply editor is in HTML mode - you can turn this on my clicking the HTML button in the bottom right of the editor. Access the Meetingbird sidebar from the ticket page (if you installed using the LiveAgent external plugin) or by clicking the Meetingbird icon in the Chrome toolbar (if you installed the Meetingbird Chrome extension). Scheduling Links allow you to setup preferences for specific types of meetings (Sales calls, product demos, recruiting interviews, etc.). 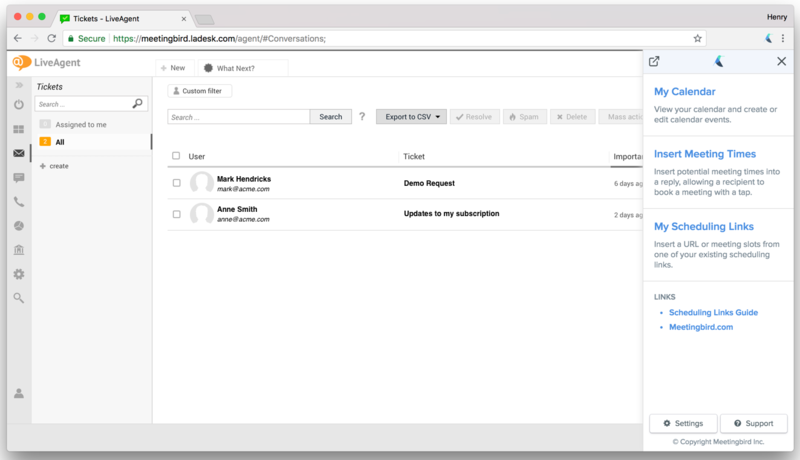 With the Meetingbird integration for LiveAgent, you can access a list of your scheduling links and quickly paste a scheduling URL into an email. Just click the "My Scheduling Links" button to do so.